Salad with, Mozzarella and Tomato, from Thyme for Cooking's seasonal menus. This is a bit of a variation on the Salad Niçoise, with potatoes and green beans. We roasted the potatoes for a bit more color and flavor. 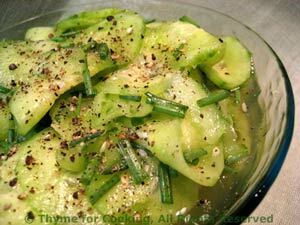 A cold salad can be just the thing for a hot summer evening. Put olive oil in a large bowl, add potatoes and stir to coat. Arrange potatoes on baking sheet with rim (I use my trusty, round pizza pan) Bake at 400F for 30 minutes. You can stir/turn once if you like to fuss but I usually don't bother. While the beans cook fill a medium bowl or pan 3/4 full of cold water. When the beans are done, drain and dump into the cold water. Swirl around until cool then drain and set aside. Prepare lettuce, tear and put into a large salad bowl. Tear large basil leaves, snip chives and add herbs to salad. Cut cheese and tomatoes into large chunks. Whisk vinegar and mustard together in a small bowl. Slowly whisk in oil. Add 2 - 3 tbs vinaigrette to lettuce and toss well to combine. Taste, adjust. 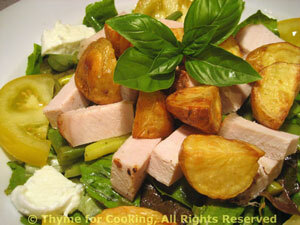 Arrange the pork, beans, potatoes, tomatoes and cheese nicely on the lettuce and serve, extra vinaigrette on the side.